The classic 1961 Blake Edwards' rom-com is finally coming to Blu-ray this September! 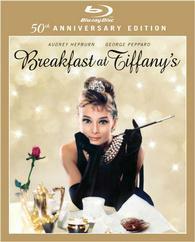 In an early announcement to retailers, Paramount has revealed 'Breakfast at Tiffany's' for a Blu-ray release on September 20. The Blu-ray will feature a new 1080p digital transfer with a DTS-HD Master Audio 5.1 soundtrack (plus a restored monaural track) and supplements will include: Commentary by producer Richard Shepherd; A Golightly Gathering featurette; Henry Mancini: More Than Music featurette; Mr. Yunioshi: An Asian Perspective featurette; The Making of a Classic featurette; It's So Audrey: A Style Icon featurette; Behind the Gates: The Tour featurette; Brilliance in a Blue Box featurette; Audrey's Letter to Tiffany featurette; Photo Galleries: The Movie, Production, Publicity; and Original Theatrical Trailer. You can find the latest specs for 'Breakfast at Tiffany's' linked from our Blu-ray Release Schedule, where it is indexed under September 20.